The Honorable Minister Louis Farrakhan acknowledges and thanks Winston Johnson (left) and John Ovnik (right) two of the music engineers that worked on the "Let's Change The World" project. Seated next to the Minister is his daughter Betsy Jean Farrakhan. Standing behind him is his son Mustapha Farrakhan (left) and Joshua Farrakhan (right). For nearly 63 years but particularly over the last 40, most of the world has known and witnessed the Honorable Minister Louis Farrakhan as a polarizing figure to his enemies and detractors but as a divine leader, teacher, guide, freedom fighter and principled man of God to the rest of humanity. During Saviours’ Day weekend, a special Friday night reception held Feb. 23 was a continuing reflection and manifestation of his divinely spiritual qualities and characteristics but with an element of surprise added with the release of the Muslim leader’s “Let’s Change The World” musical compilation project. It is a glimpse into the heart and soul of a man who has sacrificed nearly his entire life to the ongoing mission of his teacher, the Most Honorable Elijah Muhammad in the resurrection and salvation of Black people and oppressed people of the world. The reception, held at McCormick Place, was the official launch and debut of the Minister’s project and was the culmination of a 14-year labor of love. The musical odyssey features a literal “who’s who” of the music industry in terms of featured vocalists, musicians, producers and musical engineers, many of whom are award-winning and critically acclaimed experts and professionals. As guests entered the reception room which was beautifully decorated and constructed like an elegant walk-through museum, they were greeted by stunning visuals including enlarged posters of Min. Farrakhan, an accomplished violinist and vocalist pictured with industry giants like Stephanie Mills, Damien Marley, Deneice Williams, Common, Rick Ross and many others who contributed to the project. There were also stunning enlarged photographs of Min. Farrakhan performing with his violin. In the center of the room was a classy display of the Minister’s violin encased in a clear rectangular case. Sheet music from the project sat adorned on musical stands situated in front of each enlarged poster. As people toured the room, a variety of selections from the project played softly in the background. A long line of people waited patiently to purchase the limited-edition collector’s item music box set which features: 7 CD’s featuring over 40 songs, a beautiful nearly 100-page book with exclusive content and photographs, and one bonus DVD of behind-the-scenes footage. Nation of Islam First Lady Mother Khadijah Farrakhan, wife of Min. Farrakhan was present, as were many of their children, grandchildren and great-grandchildren. The crowd cheered and clapped as Min. Farrakhan entered the room. “Wow!” he exclaimed as he addressed attendees. The Minister thanked everyone for coming. “This has been 14 years in the making and it started in 2002 with a brother, he may be on the wall somewhere, Charles Veal ... he helped me in my playing of the Beethoven Violin Concerto with the symphony in Los Angeles. And he said, ‘Minister would you be willing to do an album?’ and I said ‘yes’ so we started,” Min. Farrakhan explained. Min. Farrakhan thanked the late Mr. Veal for gathering some of the greatest musicians and entertainers in the world to be a part of the project. Mr. Veal, a dear friend to the Minister and a master violinist, orchestra leader, multi-instrumentalist and singer from California, passed away in 2009. “Let’s Change The World” was recorded in 16 studios across the country including Mosque Maryam in Chicago. “It’s 45 songs in every genre you can imagine,” said Min. Farrakhan. The project includes classical, gospel and jazz, folk, opera, rap, reggae and calypso. “So, it was my life’s journey in music,” said Min. Farrakhan who began playing violin as a little boy and was a popular entertainer known as “The Charmer” before joining the Nation of Islam and becoming a student of the Most Honorable Elijah Muhammad in 1955. Not long after joining the Nation, a directive was issued by Mr. Muhammad that all those in show business would need to leave the entertainment industry or leave the mosque. Min. Farrakhan, who was then known as Brother Louis X, decided he could live without show business but could not live without the teachings of the man who raised, resurrected and taught him. His son Joshua Farrakhan took photos and videos throughout the creation and work on the project to document the historic nature of such a momentous undertaking. 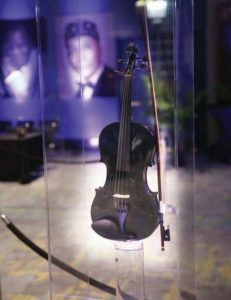 For the throngs of supporters, friends, family and members of the Nation of Islam that toured the exhibit, many were emotionally and spiritually moved by what they witnessed that evening. For many, the Minister’s music reception was the highlight of the Saviours’ Day weekend. Ahmad Muhammad of Mosque Flow, a family-owned apparel company, remarked on how different types of people were featured in the Minister’s music. “You had Black people, White people, of course who helped him do major parts of his album,” he said. The 20-year-old Austin, Texas, resident enjoyed seeing the Minister’s taste in music. “He has a very wide range of taste in terms of genres, so that was pretty cool to see that. He’s not stuck on one thing. He has Snoop Dogg. He went to the Snoop Dogg track. I thought that was cool. He played the Rick Ross track and that was pretty dope. He definitely has a good range of pool for everyone to dive into,” he said. Tauheedah Amon-Ra became a registered Muslim in the Nation of Islam in 1969 in New York and currently lives in Atlanta. Ms. Amon-Ra said the variety of artists that Min. Farrakhan collaborated with on the project is a reflection of his versatility. It also shows that the Nation of Islam has worldwide influence, she added. “It is a sign of the times and shows how the Nation of Islam has grown,” said Ms. Amon-Ra. There are so many layers to the Minister that God is revealing, explained Student Minister Abdul Hakeem Muhammad, the Nation of Islam’s European Representative who is based in London. This evening signifies a gift to us and reminds us of his brilliance and it is a gift that will remind you of Min. Farrakhan even when we no longer see him, Min. Hakeem Muhammad continued. 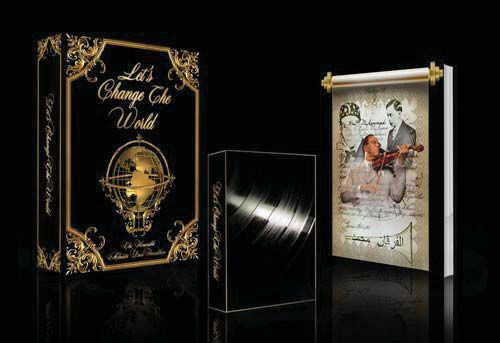 The Let’s Change The World Music Box Set is available for purchase @ LCTWMusic.com.